A vegetable garden planting guide is an excellent way to organize your planting dates. You see when to plant vegetables may vary depending on which hemisphere you live in, altitude, climate and the plant itself. It’s best to know your climate very well if you want to become an expert on it. During the growing season, check your weather forecasts daily so that you can easily predict high and low temperatures. 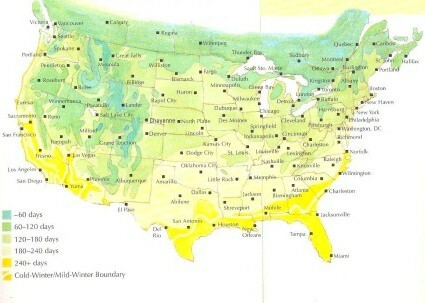 There’s a map that was developed by the USDA (United States Department of Agriculture) that illustrates the zones for different parts of the country. These zones are determined by a range of minimum temperatures for each specific region. The zones are constantly referred to on seed packets and plant labels to illustrate a plant’s hardiness. The growing season is determined by the number of days between the last killing frost in the spring along with the first killing frost in the fall. Your vegetable garden growing season will also be further influenced by its exposure as well as the region you’re located in. These dates are important when planning to plant your vegetables. Most nurseries will be able to give you estimated dates for the average spring and fall frost dates for your area. You can also use your personal garden records as a form of reference for specific data information about your garden. Take a look at the map below for the average growing season length for your area. I like to grow my own vegetable transplants because it allows me to expand the size of my harvest and lengthen my growing season. I usually start my plants about 2-2 ½ months before I plan to set them out. It’s best to do that as most seeds need warmer soil to germinate than they need to grow. Sow seeds indoors or in a heated greenhouse where they can be given the best conditions possible in their early stages. Transplants don’t really need much space as a sunny windowsill is ideal. To allocate more room for some additional plants, you can build some shelves across your window. At the same time be careful when removing anything underneath that could be harmed by dripping water. Fill your containers to the top with some sterile seed starting mix and lightly press down the dampened soil. Regularly water your newly planted seeds to keep the soil consistently moist to promote and speed up the germination process. My favorite seeding containers are the peat pots that can be found at most nurseries. I like them because the entire plant, (pot included) can be placed into the garden to reduce transplant shock. However, plants in peat pots tend to dry out rather quickly. When setting them into the garden, tear off the part of the rim above the ground to prevent it from acting as a wick that will cause the plant to lose water. You can use any container that will hold soil to start transplants provided you insert some holes at the bottom for proper drainage. Remember to label each container with the name of the variety you planted for good organization. Water your seedlings every 2 days or whenever they look dry by misting the soil surface with a spray bottle. The gentle spray is suitable as well as easier on the young plants and a couple of light waterings is better than a gush of water which can dislodge new roots. There are also some trays that you can use for your seedlings with the holes below for watering. These are some things to consider for your vegetable garden planting guide. Your vegetable garden planting guide is a very essential tool when you’re ready to plant your vegetables. It’s an excellent form of planning.